I'm so glad that after lurking in the shadows for far too long, Summer decided to show herself last weekend. She not only showed up, she showed off! It appears that she is sticking around for awhile since she received such an enthusiastic welcome. 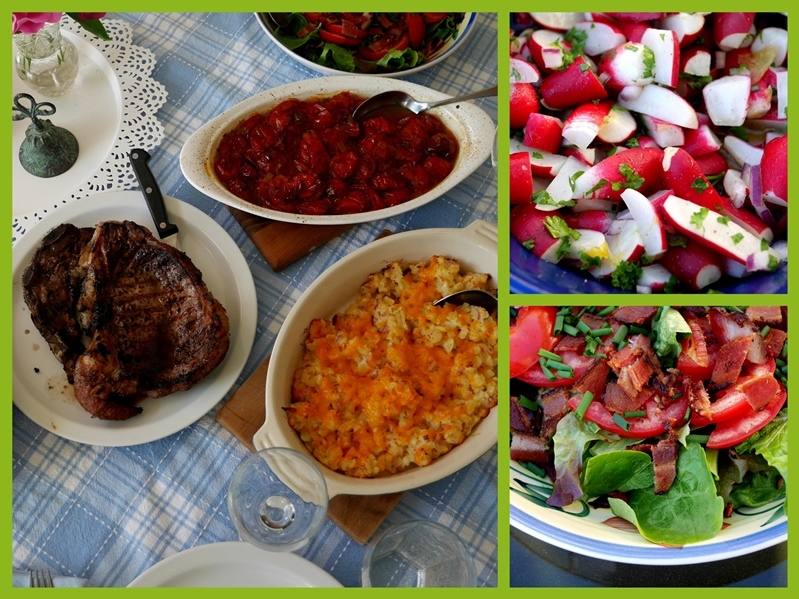 We celebrated Victoria Day last Monday by staying home, working in the garden, and enjoying a dinner full of summer flavours - barbecued steak, radish salad, BLT salad, and some roasted tomatoes from last year, tucked away into the freezer for the winter. I'm keeping a close watch on the peony buds - there are many of them, and I love their ruffled blooms. Tim got the irrigation system working, and caught me unawares a couple of times by turning it on "just to check." I can move very quickly if needed! In the vegetable garden we're harvesting lettuce (need some? ), radishes, and lots of herbs. I saw the first red on a strawberry this morning and am looking forward to their juicy sweetness. I'm keeping a jug of water and mint leaves in the fridge for a refreshing thirst-quencher. I only drink water, tea, and wine, (occasionally hot chocolate) and there's nothing like cold water for assuaging thirst. A square of dark chocolate and a few nuts fill the need for a little sweetness and crunch. I'm thinking that I should harvest some of this mint, and the oregano behind the tray in the previous picture. The herbs are the first things I harvest, then they flower, get cut back, and grow again throughout the summer and fall. I like hot mint tea, do you? I also like fresh mint in salads. I smile when I look at our little "vineyard" - two vines of eating grapes, purple Concords, and a green variety that I'm too lazy to go and check. They remind me of little soldiers all in a row, growing straight up to catch the next support. Garden experts here tell us that our growing season is about one month behind normal years. It's been a long, chilly season. I think, though, that the heat and sun is causing everything to work hard at catching up. I planted squash seeds rather late, in pots in the house because of the cool weather. On Sunday I set the box out into the garden. They were still plain dirt. On Monday morning I noticed the first faint curl of palest green beginning to push up through the brown dirt. Throughout the day I checked on the pots and could almost see the progress. By the end of the day most of the plants had their seed leaves. Now I'll wait until the true leaves appear before planting them out. Before I do, though, I have the hard job of choosing just one of those plants from each pot to grow. I really hate doing that. Those seeds are all miracles and here I am, playing God and deciding which one of them will live. I feel the same way about thinning carrots, beets, and radishes. I'm admiring the prettiness of radishes, and we're eating them by the handfuls. I inter-plant them with carrot seeds and by the time the radishes are finished, the carrots are almost ready to thin. But that's made easier by the growing of the radishes between them. I don't have to kill off so many carrots. Win, win. I'm pondering technology and its effect on my life. I think it is important for me to be intentional about how I spend my time. I've noticed that podcasts seem to be more popular. I've tried listening, but it takes so.much.time and I would much rather read than listen and watch. Do you listen to/watch podcasts? I've joined Instagram and I'm not entirely sure about it. I see that a lot of the bloggers I follow are also there, and that's perhaps why blogging isn't as strong. I understand the instant appeal, but I'm finding it rather demanding. What's your experience with Instagram? Four more weeks of classes, then a final week week of assessment, report cards, and cleaning out the classrooms. Is it fully summer, (or winter) where you live? Any plans? I know podcasts and tutorials on you tube at great....but I don't have time for them. I can't keep up with my blog and when I'm too tired for anything else...I read! And yes, I would love some fresh lettuce and some of that mint for my tea! Love the bee in the flower...you can keep him though! Enjoy your afternoon! Hugs! How very healthy your vegetables are. My radish have been very hit and miss, straggly with the odd good one. I love anything with mint and grow several different varieties, apple mint is a favourite. Like you, I'm waiting for my one peony to come out of its tightly furled buds. What beauty and promise of future produce in your photos! I'm glad summer has arrived for you. I find my blogging is sluggish--not as much energy as I used to have, but it could be from the distraction of taking care of my husband after his surgery, and I might get more into it again. I see you on IG and I do enjoy that as I love photos and editing them and it's so quick. It's also an easy way to stay in touch with others but something you can take or leave and visit or not. So easy with my phone. I guess it's a creative outlet for me and I feel less "pressure" there than with blogging. I appreciate the beauty I see there. The only thing that I do is blog - I don't understand what Instagram is all about - it appears to be random photos with no storyline or information included. My favourite thing to do with mint is make a sauce to have with roast lamb, and I also like sprigs of mint placed in the water when boiling new baby pototoes. That water looks so refreshing! Beautiful photos... Instagram...not enough words for me so it will never be my favorite. I waffle back and forth between carrying on and letting go. Mint...I like to put a leaf in my cup before pouring in the coffee, and then taking it out when the hint of mint flavor is where I want it to be. Instagram...It is so easy to catch up on what's going on, and the beautiful photos are a bonus. Podcasts...Methinks, after a while, the media du jour wears thin, think myspace all the way to facebook. Blog reading is nice, but seeing a thousand words/photos is a refreshing alternative, and for sure, hearing a voice brings the togetherness connection to another level. I thought of doing a podcast, gave it some research time, and let it go for a future re-visit because its more personal than I care to be online. Also, listening to voices while painting, writing, sewing or whatever, increases concentration for me, and I believe it does for others as well. It's still pretty cool here on the Island but we hope and pray the warm weather will make an early appearance this year. Last year we had about three weeks of beach weather which was when all the kids were home but after they left, the weather was over for another season. Therefore we are coveting a longer summer this year. I love radish and I eat it almost every day. Fresh from the garden must be wonderful! I am allergic to mint. I am not on Instagram or anything else really. I am content simply blogging and I do well to get at least one post a week on at the moment. It is always to pleasure to visit you. your garden looks lush and those radishes are a thing of beauty. Mint water sounds like something I would enjoy...I have never even thought of adding mint to water! I've only used mint in some of my Mediterranean cooking. I'd love to see how it tastes in water or iced tea. And growing your own grapes! How terrific! Have you planned a name for your wine label?! Love that you are doing this and I so agree with you on thinning your veggies. I think that's why my carrots took so long to mature last year, I barely thinned them...so sad! I'm going to try the trick you have with the radishes. I planted the carrots and lettuce about 4 weeks ago...I maaaaaaay thin them a bit to allow for the radish seeds! A bell went off in my head when you mentioned so many of 'our' group on IG. I've had a steady drop in page views and comments in the past few months and I've been perplexed. I've never written my blog as if it were a popularity contest but now that I also write newspaper columns, I sometimes get overwhelmed. So, perhaps it's the ease of IG. Instant gratification. There is a blogger I follow that started out on IG about 15 months ago. After 6 months she had around 10,000 followers. She decided to start a blog and almost overnight it is huge. She is doing paid promotional work and had quit her day job. I just keep telling myself that the writing experience is never lost, nor the good friends I'me made. I only blog, which suits me as I can pop in and out when I want to. I have looked at podcasts but find them too time consuming and sadly I do not really understand what Instagram is all about. I drink a lot of mint tea and add a little ginger or lemon when a more intense flavour is required. Your garden is looking so gorgeous! My mint is surviving but some has already succumbed to the heat and we've not even gotten really really hot yet. Of course, mint tea is very popular on this side of the world, as is putting mint leaves in salads. Dark chocolate and nuts is one of my favorite snacks and I do love me some wine. :) I enjoy blogging because of the friends I've made over the years and not all of them have moved to IG, but it is also fun to catch up with blog friends there. Social media is what you put into it. We are in control of our time and make choices how we'll spend it. IG is quick, blogging takes a little more time; I like both for different reasons. I've tried listening to craft podcasts but so far have not found one that can hold my attention. And really, an hour is just too long to ramble on in my opinion. Even TedTalks have a time limit. I'm more into watching inspiring videos on youtube about permaculture, tiny house living, making a difference, etc. Have a great weekend. I listen to lectures / teachings on You Tube when I am quilting....don't do Instagram, Pinterest, etc. I've greatly cut down on time spent blogging in the last few months ; I still post a bit but don't join many parties or anything like I used to. Your garden produce looks wonderful...doing so well / I grew mint last year and loved it in water with some cukes and lemons. Lovely photos and that collate looks yummy. The only podcasts I watch are our church sermons that I happen to miss. Your Victoria Day BBQ made my mouth water. I'm also enjoying watching my peonies bloom. Because of the record-breaking rainfall that we've received this spring, everything is so green and lush here. I don't usually listen to podcasts, but they may be good for long drives or exercising? I don't have an Instagram account, but I do check out the public Instagram accounts. A few years ago, a millennial tried to explain "Snapchat" to me, i.e., you "chat" by sending each other photos. It sounded silly to me and I didn't think it would last, but now it's one of the most popular forms of social media. So clearly, I know NOTHING about technology. HA! I am glad that summer has finally arrived in your corner! I know you have been waiting . . . I rarely listen to podcasts. (Auditory learning is not my strength. And they do take lots of time.) I think that I would enjoy Instagram. I am new to the smartphone, but that is one thing I'd like to do with it. But blogging is slower and word-filled and that is more my style. Love your photo of the peonies about to bloom . . . full of promise! A beautiful post. I've also joined instagram but don't like it as much as blogging. There is the instant response but not the depth and for me blogging is every bit as much about the words as it is about the images. YOur post is so beautiful with all the lush plants in your garden. I think I am going to buy some mint and cucumbers to make a nice refreshing water to drink thanks to you! Hugs. Your vegetable/salad garden is coming along wonderfully, I understand completely how hard it is to thin the seedlings out that's why I always used to have too many courgette plants. Now that I don't have a large potager any more life should be easier this year. BTW I'll take a couple of those lettuces off your hands! Not an instgrammer, wouldn't know where to begin, blogging is my one weakness! Your garden is certainly flourishing! I listen to BBC4 radio podcasts (current events and A Book at Bedtime) when I am travelling by myself. I listen just before I go to sleep and sometimes have to listen more than once. When I am home, I don't listen as much (husband). I don't really use Instagram that much although I do have an account. Everything is coming along beautifully over there! I mostly listen to podcasts of church sermons I have missed, and don't watch many you tube videos either. My granddaughters put me on Instagram a few years ago, and I haven't used it much until recently. I like that it is all 'personal photos' and not shared news articles like on FB. It's definitely quicker than blogging, but I miss 'the words'. Oh Spring looks good and tastes even better around your home (I swear seriously I can almost taste those salads). I hated thinning for just the reasons you said! To the detriment of our garden often. And pruning the same ... everything grows fairly easily (as you know) in the Pacific Northwest and I just hated pulling up the little shoots that squirrels and birds brought in -- always felt like I should give them a chance. We were always in danger of having the jungle overtake the house. I barely even have time to listen to NPR any more ... so little time and would rather read. So no to podcasts. I joined Instagram months ago -- thought about it as a way to (mostly) save recipes, but haven't used it at all yet. Guess I still belong. Oh goodness Lorrie - how things are changing in blogland these days. So many are leaving, or taking breaks, and others are apparently moving to IG which I don't do and don't plan to do. I will continue with my blog as long as I enjoy it, and it is my only foray into the world of online creativity. I take far too many photos, traveling, at home, in the garden, on tables and kitchen countertops. . . . . . .you name it and I feel obligated to hit that shutter button! But I still enjoy it and now I'm home again for the summer (only short local trips planned right now), I hope to be a better commenter - I've just not had time. Catching up after no real Internet whilst on the ship for two weeks, I'm having to work on the recent Sicily trip posts full time. I do have lovely places to share for anyone interested, and of course my blog is basically my journal so whether anyone has time to read - or comment which is always appreciated and is always a perk which makes me smile, but I understand how life gets in the way. Love all your posts, always, you are a good friend so I hope you stay - I'm definitely going to miss dear Pamela! I like your raised beds and besides tea, I pretty much only drink water too. Great idea to put a jug in the fridge with the mint already in - I usually pluck a leaf or two and throw it in my glass. If this is the time to confess - yes, I've become a lazy blogger - much preferring Instagram and FB. I can post on IG and have it go right to my FB so kill too birds with one stone. It's quicker, there's a like button and you can leave a comment if you want. Also, once I take a photo on my phone it can be uploaded right away - no downloading to the laptop to construct a blog post. I suppose we evolve with technology as it comes along and these days the quicker platforms seem more popular. I like Instagram for a visual "quick fix," but so enjoy the narrative of the blog world. Images just don't tell the whole story. I love your beautiful images, but I really enjoy the narrative you put in telling "the rest of the story." Podcasts are good, too, and many good Bible teachers have their own. But, I find I am listening to those less and less these days. I made a wonderful couscous salad with mint and basil earlier this spring. Fresh lemon juice and zest over the couscous along with olive oil and seasonings, fresh finely diced cherry tomatoes, and the finely minced basil and mint. SO fresh and yummy!